I am a book blogger/reviewer, I can talk about almost any books I've read that I'd fallen in love with. 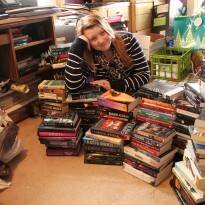 I have too many books that I still have to read and I will always find a book boyfriend in each book I read. So I know I have not been on Booklikes since signing up pretty much, but I would like to explain my reasons. Then I'll let you know what's the New Year will be hold for me, it an The Cat's Meow post meme that I do on my blog. I know many bloggers weren't happy about Goodreads changed in policy or such ( I can't even remember) anyways I haven't had much issues with my Goodreads and while I do post reviews on Goodreads, I use my Blog as my largest network for reviewing, then I share it on Twitter and Google +, then it makes to Goodreads last. Right now my biggest issue with Booklikes is that there's no app for it, believe it or not I do some of my blogging drafts on Blogger App on my Ipad. It allows me to get ahead start when its 2am in the morning, just finished with the book and want to write down some notes . . . however I don't want to open my computer, that's why I love going on my Ipad. I've looked for Apps on Booklikes but there's nothing and that makes it harder for me to really use it on a regular basis. So I hope you can deal with me being absent on booklikes until I figure out how I want to go about with Booklikes. Celebrate SassyCat's Books review One Year Blogaversay on March 1st, however that is the same weekend I'm away for bowling so I'll have to figure something out as far what I want to do for SassyCat.